A team at work on board J-boat “Ranger”. No Norwegian vessel ever partook in America’s Cup, but many an American boat counted a majority of Norwegians among its crew, rendering Norwegian sailors an important factor in this particular regatta. Throughout the 1870s and 1880s a good many Scandinavians, especially Norwegians, were hired as captains, mates and crew on American vessels. 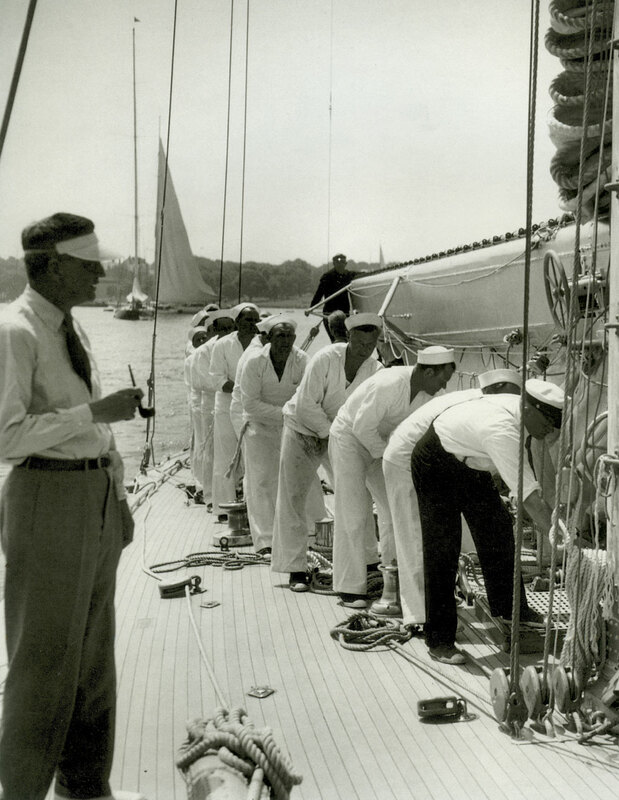 In a show of good seamanship they were given the opportunity to play a vital role in the battle for America’s Cup between 1893 and 1937, in other words, for the better part of some 50 odd years. In fact there are traces of Norwegian America’s Cup involvement up until 1974. Professional crews from Norway were a common sight at the end of the 1800s, even prior to the Tysnes involvement. The pronounced Norwegian yacht sailing presence brought about the byname The Norwegian Steam. Places like Horten, Arendal, Egersund, Karmøy, Bergen, Tysnes and Bømlo were represented. Books on the subject rarely mention them, but when they do, the term The Scandinavian Crew is often used. Norwegians from several local communities were involved throughout the 20th century, too. The Tysnes element grew in scale, especially up until World War 2, which is this particular website’s – and our exhibition’s – focal point. The war put an end to that era, and the post-war years saw only a handful of Tysnes men involved in US professional sailing. A great deal of money and prestige has been put into this competition, as is the case, even today. We know of Norwegian America’s Cup participation during the second half of the 19th century. The first demonstrable proof, however, dates to 1914, with Engel Vaage‘s (also known as John Christensen) involvement as 1st mate on “Resolute”, winning that year’s preliminaries. Most of the 30-man strong crew was Norwegian, among whom nine from Tysnes. Preliminary counterparts were “Vanitie” and “Defiance”. The great war (WW1) broke out shortly before “Resolute”s participation in the Cup itself, against contestant “Shamrock IV”, owned by tea mogul Sir Thomas Lipton, resulting in an indefinite postponement. War eventually ended, paving the way for “Shamrock IV” and “Resolute”s 1920 battle, resulting in a “Resolute” victory, and the perpetual cup remaining in America. Gunnar Gjerstad (also known as Gust. Olsen), soon to play a vital part in US sailing, now held the 2nd mate position, according to the “Resolute” 1920 crew list.